"What you are entering now, Mr. President and Mr. Vice President, will tend to draw you away from your ethical center. But we, the nation that you serve, need you to hold the ground of your deepest values, of our deepest values. There is a story attributed to Cherokee wisdom:One evening a grandfather was teaching his young grandson about the internal battle that each person faces. "There are two wolves struggling inside each of us," the old man said. "One wolf is vengefulness, anger, resentment, self-pity, fear . 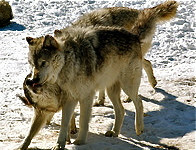 . . "
"The other wolf is compassion, faithfulness, hope, truth, love . . ."
The grandson sat, thinking, then asked: "Which wolf wins, Grandfather?" His grandfather replied, "The one you feed." Thanks to Dr. Watkins for making such good use of the time she had in front of our incredible new President. The entire sermon is lovely. To see a video of the first half of her sermon, which includes this story, Dr. Watkins, click here. This page contains a single entry by Lynn Allen published on April 20, 2009 7:47 PM. Crones Act to Stop Abuse - Silently and Spontaneously was the previous entry in this blog. Democracy is a Participation Sport! is the next entry in this blog.